This baby pink concoction might seem like an odd choice for my husband’s birthday cake, a husband who is half bear and half lumber jack outwardly, but Jonah Hill’s character from Money Ball on the inside. 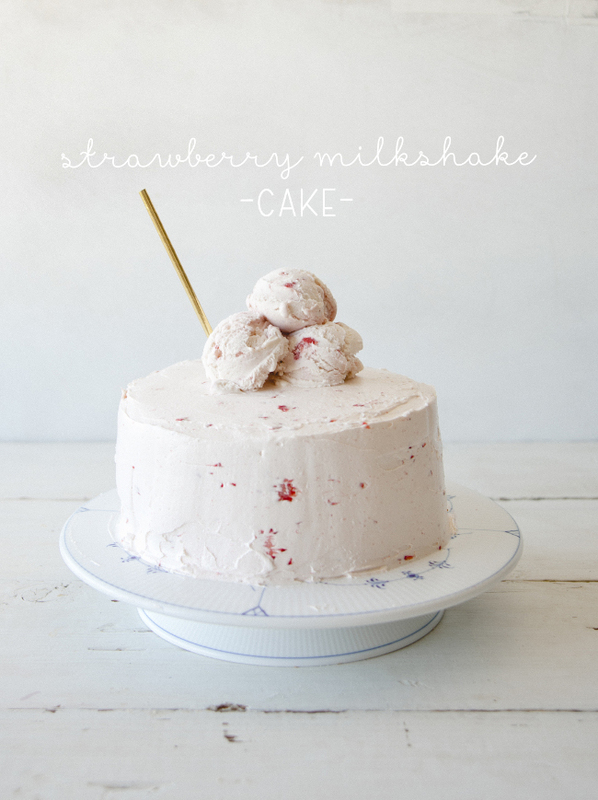 I wasn’t even sure if he liked strawberry milkshakes (he doesn’t, but loves this cake). But this frosting was so good, so spoonable, so bottom of the bowl lick-able, that I felt compelled to make it for him. 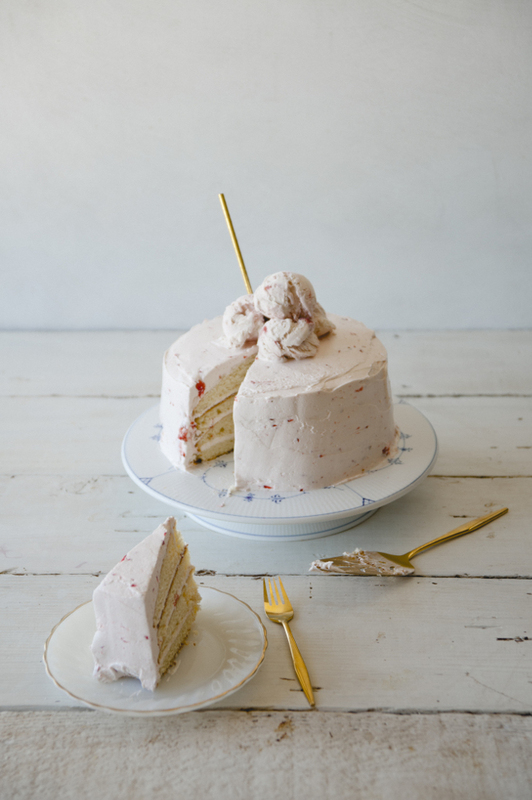 I paired the frosting with my Aunt Tina’s buttermilk cake, and it indeed tastes like a strawberry milkshake. For extra fun, I topped it with giant scoops of ice cream and a straw. Craig was pretty incredulous at first, but after two slices, it was announced that he enjoyed this cake almost as much as Devil’s Food Cake with Seven Minute Frosting, his absolute favorite, and probably the reason he married me. It’s a good reason. Access to good cake is foundation level stuff for a successful marriage, I hear. I want to try this recipe with blackberries next spring, and maybe fresh plums in the summer. It could be my new favorite thing. Enjoy! Preheat oven to 350 F with rack in center of oven. Grease two 9-inch x 2 inch cake pans. Then line the bottoms of the pans with parchment or wax paper, then grease the paper. Place the cakes on a wire rack to cool, in their pans, for about 10 minutes. Then invert the cakes onto a greased rack. Remove the parchment or wax paper and re-invert cakes so that tops are right side up. Cool completely before frosting. 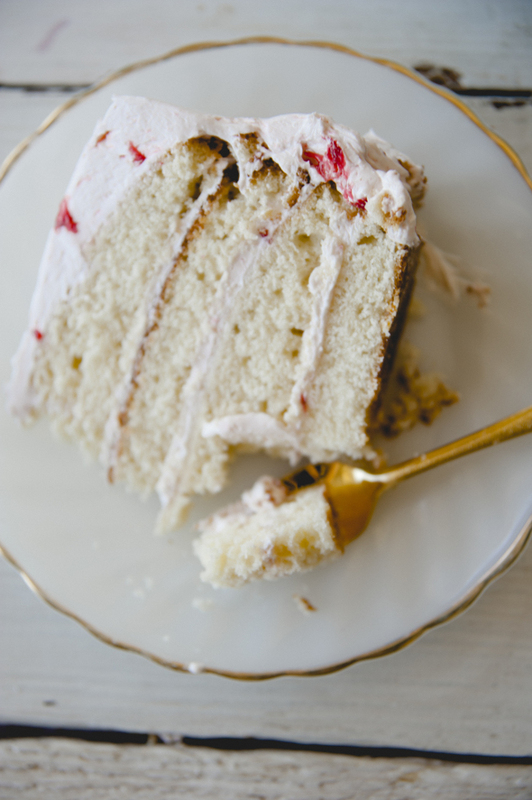 With a bread knife, gently cut the center of the cake layers, creating 4 thin layers. To decorate, place a cake layer on a cake platter, and top with about 2/3 cup frosting, enough to make a hefty 1/4 inch layer when spread. Spread almost to the edges and gently add the next layer, no need to press. Keep layering until you have 4 layers. 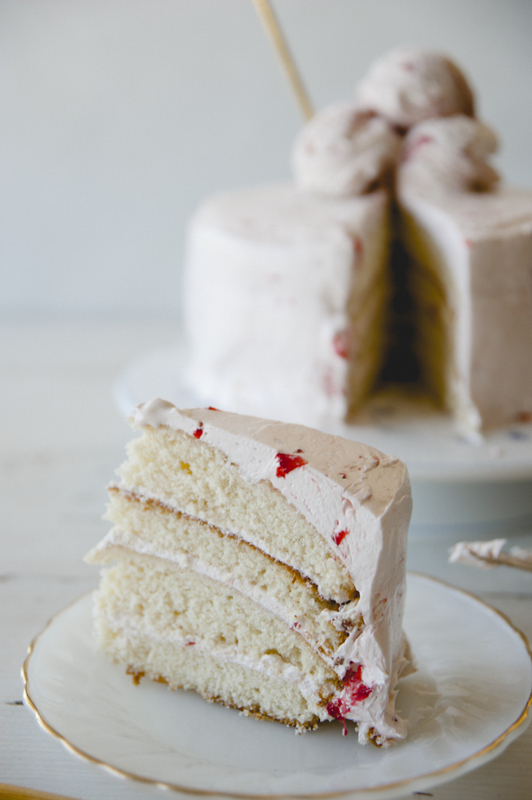 Put a few cups of frosting on top of the cake, and with an off-set spatula or butter knife, spread the frosting from the top to the sides, turning the cake platter to help you cover the entire cake. Add frosting, smoothing with your spatula, until you have a 1/2 inch layer over the entire cake (or more, if you prefer). 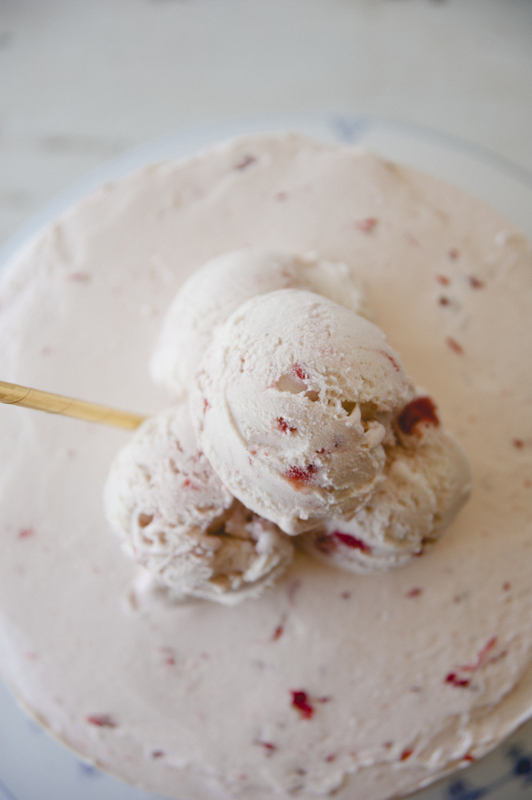 To serve, top with a few scoops of strawberry ice cream and a straw. Enjoy! To smash the strawberries and create the pulp, de-stem and quarter strawberries, and place in a plastic bag. Close the bag, pressing out the air, and smash with your fingers until a fine pulp. In a small saucepan over medium heat, bring sugar and 1 cup water to a boil. Continue boiling until syrup reaches 238 degrees on a candy thermometer (soft-ball stage). Meanwhile, place egg whites in the bowl of a standing mixer fitted with the whisk attachment, and beat on low speed until foamy. Add cream of tartar, and beat on medium-high speed until stiff but not dry; do not over beat. With mixer running, add syrup to whites in a stream, beating on high speed until no longer steaming, about 3 minutes. Add butter bit by bit, beating until spreadable, 3 to 5 minutes; beat in vanilla, and salt. If frosting curdles, keep beating until smooth. Add the strawberry pulp and mix. The pulp should be a very pale pink, and taste like fresh strawberries. Fold in smashed strawberries.